The Cottage Garden. Articles related to the cottage garden. Cottage gardens don't look designed. In fact, they're usually exuberant, free-flowering, and sometimes even unrestrained. To get the informal look, avoid planting in straight lines or defined patterns. 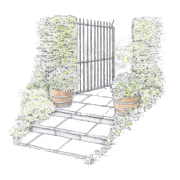 Let plants cascade over paths and weave through each other. It adds to their charm. And grow self-seeding plants that pop up in unexpected places. Cottage gardens appeal to the romantic in all of us. Their generous variety of plants growing together in a relatively small space speaks of bounty and life -- not to mention making for a perfectly manageable garden project -- and the overall look reminds us of a simpler, gentler time. The cottage garden is one of the most popular styles of gardening and is popular throughout the world. In France this garden style is usually called the 'jardin de cure' (priests garden) or the 'grandmothers garden'. 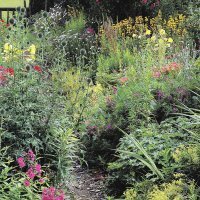 The idea is basically the same and conjures up visions of rampant and informal planting where perennials, annuals and biennials mix together and often with vegetables and herbs too. Perfume is also important and the scent of old roses should mix with the scent of honeysuckles, lilies and old fashioned pinks. A traditional cottage garden would not contain a lawn but would have paths and large borders filled with a riot of planting. Modern versions of cottage gardens usually incorporate a lawn - important either for children to play on or for adults for relaxing and entertaining. Hard features should be kept simple and made of inexpensive materials as would have been the case with the original cottage gardens - the gardens of rural cottagers. Make sure the materials match those used in the building of the house. For example use brick paths to suit brick walls and stone paths if the house is built of stone. The original cottage gardens generally would not have included garden furniture but nowadays we want to enjoy and relax in our gardens and seating is important. Wooden benches and simple metal tables and chairs rather than exotic hardwood furniture would be appropriate. Cottage garden style can be formal with paths edged by box or lavender or with symmetrically shaped beds, indeed this is often the style where vegetables are a significant part of the cottage garden style. When gardens have this formality the cottage style is introduced in the abundance and informality of the planting within the hedges or beds. 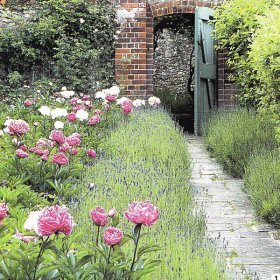 A fragrant path: with masses of pink peonies behind a wall of lavender. 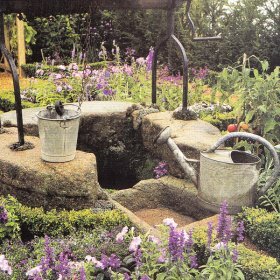 A Centre piece: This well is a nice setting for salvias, petunias and some tomato plants. 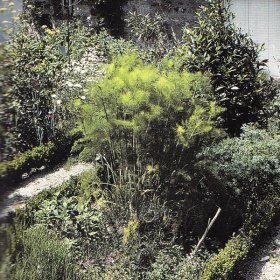 Low box hedging encloses the contrasting textures shades and textures of feathery fennel and Bay tree.